A total of 713 players converged in Shizuoka for this triple Standard Grand Prix weekend, just a few days after the conclusion of Pro Tour Ixalan. What were some of the highlights of Day 1? Let us learn about the new discoveries within a matter of minutes! Fresh off Pro Tour Ixalan, the Standard metagame was in the process of taking shape. As the early rounds started, it was unclear what the metagame would look like. However, we can check out what the established pros were playing, just to get an idea of what was popular.There were exactly fifteen players with three byes in attendance at Grand Prix Shanghai, including Pro Tour Hall-of-Famers, Platinum pros, and Gold Pros. There were not many deviations from our expectations and a lot of the top players chose to run tried-and-tested archetypes, especially when they just finished practicing, and preparing for Pro Tour Ixalan. However, what was noteworthy were their tweaks to their main decks and sideboards in anticipation of the evolving metagame. For instance, Four-Color Energy was "twice" as popular as Temur Energy, meaning that six players were willing to complicate their mana base with a fourth color to include mirror breakers such as The Scarab God and Vraska, Relic Seeker. One player even eschewed Glorybringers altogether and played with the complete playset of The Scarab God. As for sideboard options, players are running as many as three Vizier of the Many Faces and not everyone agreed that River's Rebuke was even worth one sideboard slot. In addition, one of these Four-Color Energy decks was actually Sultai splashing red, rather than Temur splashing black. These were the interesting changes that can make or break a certain matchup. As for the Ramunap Red lists, they all looked pretty standard except for the quantity of Rampaging Ferocidons. Interestingly, one (or more) player had four in his main deck, one (or more) player had four in his sideboard, and one (or more) player had none within his 75! In addition, Harsh Mentor was the other card which were valued differently, with players running zero to four copies. These pillars of the format will determine the Standard metagame for weeks to come but there was also room for innovation. 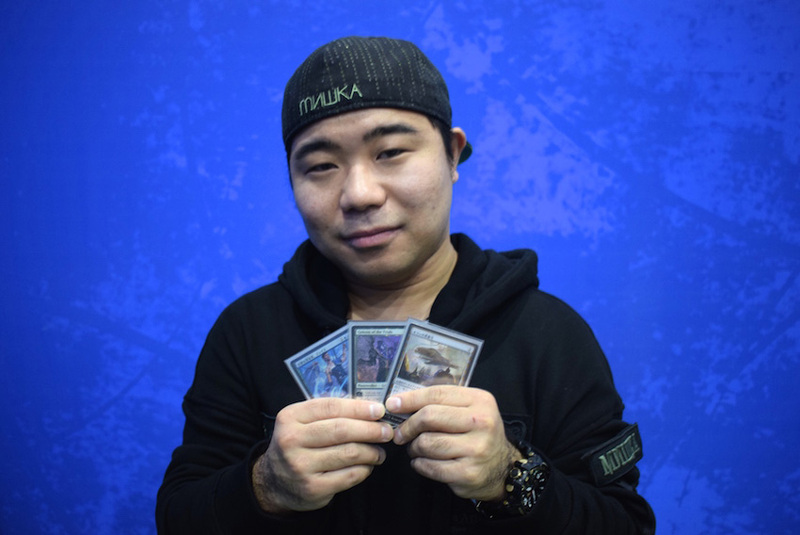 Nobuhiro Yamada is an avid grinder who has dreams of playing on the Pro Tour one day. As a frequent participant of Preliminary Pro Tour Qualifiers, he also arrived in Shanghai today in the hopes of securing his first Pro Tour invitation. After going 5-0 at a Grand Prix Trial yesterday, he followed that up with a 4-0 start in the main event with a home brew! Call it White-Blue Aggro (let's go with that), White-Blue Vehicles, or White-Blue Planeswalkers, he put together a masterpiece which was able to stand up against the titans of the format. Yamada explained the inspiration behind his own creation. "I wanted to use Heart of Kiran. It is a very well-position card in the current metagame First, I thought of a midrange-control deck but without enough creatures to crew the vehicle, it was not very good. Because of that, I added the creature base of Toolcraft Exemplar, Glory-Bound Initiate, Scrapheap Scrounger, and Nimble Obstructionist." Building a deck around Heart of Kiran was not particularly revolutionary but supporting it with the full playset of Jace, [autocard]Cunning Castaway[/autocard] and Gideon of the Trials was a first. "Turn-two Heart of Kiran and turn-three Planeswalker is very strong. Both planewalkers also "attack", which means that it is really good against control. Jake's looting ability is important to find Settle the Wreckage, which is the biggest card to swing races in our favor." Indeed, Heart of Kiran played very well alongside eight planeswalkers that cost a mere three mana. Settle the Wreckage was synergistic because the planeswalkers force opponents to attack with numerous creatures. This setup often led to a perfect, and inevitable, blowout. 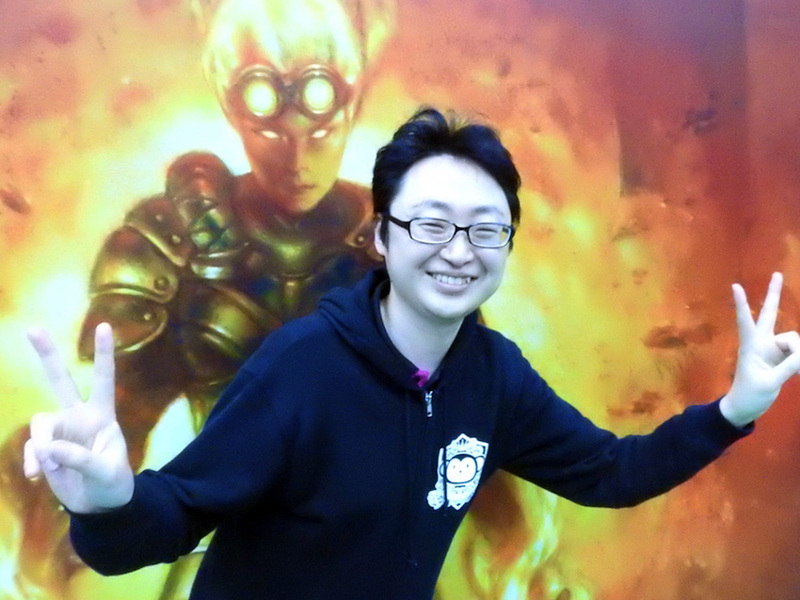 Against Temur Energy, Yamada believed that it was a 50-50 matchup before side boarding. Tocatli Honor Guard and Solemnity were great against energy strategies, since the former prevented a plethora of "enters the battlefield" effects, while the latter shut down energy gain altogether. He felt slightly disadvantaged against Ramunap Red. However he said that control decks were "easy wins". With the rise of Blue-Black Control, Grixis Control, and White-Blue Approach decks, Yamada anticipated control decks to occupy a bigger percentage of the metagame from before. "This is an aggro deck at heart, with some counterspies. The idea is to resolve some early threats and protect them. Spell Pierce is surprisingly good while the other counterspells are also tempo plays against expensive spells. Sometimes, Nimble Obstructionist can counter abilities from Hazoret the Fervent, Bomat Courier, and The Scarab God." This was certainly one of the most unique decks of the weekend and we certainly hope that Yamada can keep up with his great performance. If anything, Yamada's White-Blue deck might prove popular enough to occupy a spot in the future Standard metagame! You never know! Yuya Hosokawa is a Grand Prix regular with almost 30 lifetime Grand Prix attendances. Over the last few years, not only was he an active PPTQ, and RPTQ grinder, he also attended numerous Grand Prix this year. He frequently tunes in to coverage, follows Magic-related news, reads articles, and also practices on Magic Online. Naturally, he found out about Gerard Fabiano's Sultai Pummeler Deck Tech (create link to this Youtube Video - https://m.youtube.com/watch?v=aEnLSbXGXCM) which eventually ended up as his weapon of choice this weekend. Modifying the Sultai Energy core, the result was Sultai Pummeler, an energy variant with an exciting combo element. Once he discovered this novel idea, Hosokawa decided he wanted to bring it to Shanghai. After running countless games over the last few days, Hosokawa felt confident enough to pilot the deck. He shared that there were two ways to play this deck. The first way was to operate like Seth Manfield's Sultai Energy deck which won Pro Tour Ixalan, starting with Glint-Sleeve Siphoner, Rogue Refiner, and Bristling Hydra. Now, this was an effective way to quickly build up a board of threats but it wasn't the most combolicious way to win. The second path was to pummel through with a lethal Electrostatic Pummeler. "The deck already plays Blossoming Defense and it is perfect for protecting your combo. Cartouche of Knowledge is extremely effective when your opponent does not have Whirler Virtuoso on the battlefield." Indeed, it was not difficult to amass six or nine energy to activate Electrostatic Pummeller two or three times and with the "fallback safety net" of a solid Plan A, it was a choice which Hosokawa was willing to make this weekend. He felt that the deck was advantageous against traditional energy variants and also Ramunap Red, two of the decks which he expected to show up in heavy numbers. "Against red decks, I have Cartouche of Ambition and all I need to do is to time it properly and I can gain all my life back. Greenbelt Rampager also comes in for that matchup and the 4-toughness will be great against Lightning Strike and Abrade." However, the deck was not without weakness. "Some energy decks play Walking Ballista, which Electrostatic Pummeller terrible against. Glorybringer was also great so I also have Lay Bare the Heart to deal with it while checking my opponent's hand for removal spells that can disrupt my combo." Duress was also good against the control decks out there and Hosokawa further improved his sideboarded games with Nissa, Vital Force. Just in case you guys missed the deck on Video Coverage last week, here was what Hosokawa registered this weekend. Remember, in order to keep up with the shifting trends of Standard, keeping yourself updated is a great way to stay ahead! After nine rounds of competition, only two out of 713 players finished 9-0, namely Morofuji Takuma and Kojima Tatuya. Let's get to know them a little and help them celebrate their momentous feat! First to reach the finish line was Kojima Tatuya. 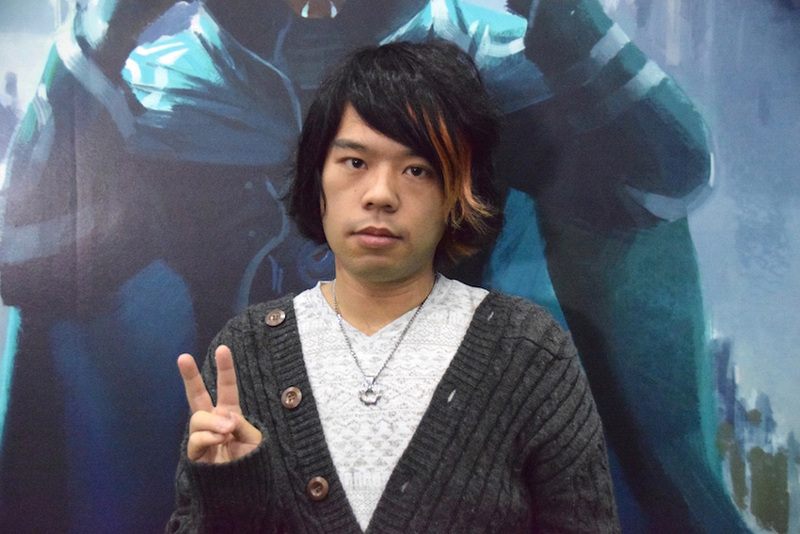 As an aspiring pro player from Osaka, he participated in all Asian Grand Prix this year and frequently attends PPTQs and RPTQs. To further hone his skills, he practiced further on Magic Online together with his friends and teammates. After watching Guillaume Matignon's rise to the Top 8 with Jeskai Approach, he quickly grew fond of the deck and that was what he decided to play today. How did he feel about his excellent day? "Today in Round 9, I received my first featured match and this was also the first time I went 9-0. I hope that this weekend will also be my very first Top 8!" 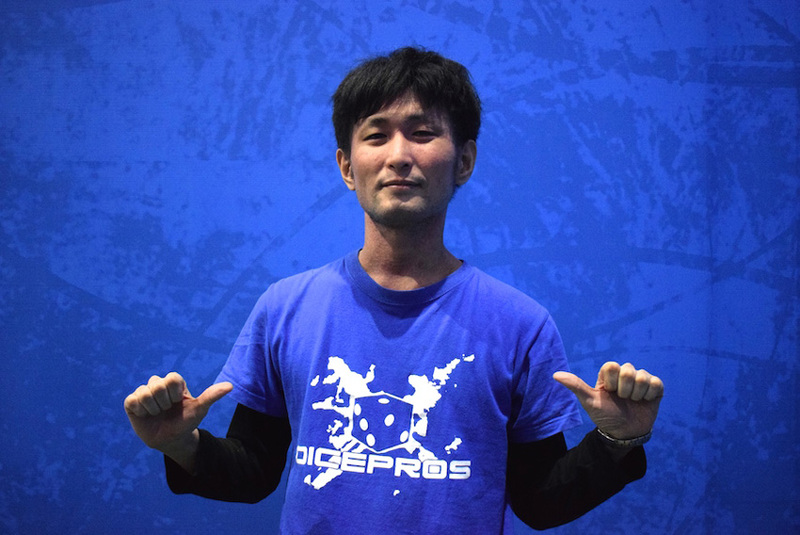 As for the other undefeated player, it was Grand Prix Kobe 2015 Champion, Takuma Morofuji. To finish the day without a scratch, he had to defeat China's very own Liu Yuchen in the Ramunap Red mirror match. Despite stumbling on mana, Morofuji was able to turn things around in a couple of nail-biting games. When questioned why he chose this deck this weekend, Morofuji explained that Ramunap Red was also what he played at the Pro Tour last weekend. "I practiced a lot with this deck and I think it is better to play a deck I am more familiar with. I did not do so well at the Pro Tour but I'm glad I have a chance to redeem myself." And with this 9-0 performance, he put himself in a favorable position to make the Top 8 tomorrow. With that, we have come to the end of Day 1 and we hope these players will keep up with their impressive run!